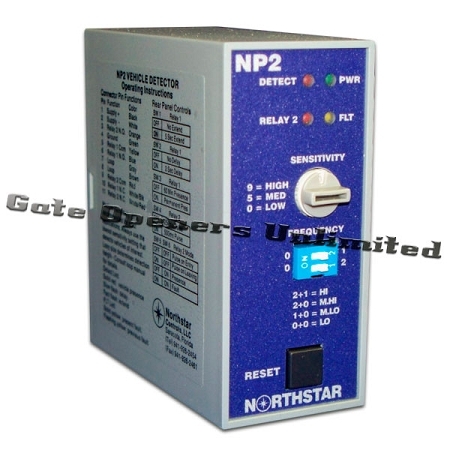 The NorthStar Loop Detector - NP2-240 Single Channel has been specifically designed and engineered for use in the Parking/Access Control industries. With standard operations including programmable pulse and presence options, fail-safe or fail-secure operation, compatibility with all radio controls, timing features and more, the NorthStar Loop Detector - NP2-240 Single Channel covers your detection needs. The NorthStar Loop Detector - NP2-240 Single Channel wide inductance range allows for use with small loops sometimes found in the Parking/Access Control industries (for recommended loop sizes please consult the Northstar Loop Information Guide). Small size and full list of features lend the NorthStar Loop Detector - NP2-240 Single Channel to any Parking/Access Control use from simple presence detection to configured pulse/presence lengths with output extensions and/or delays.